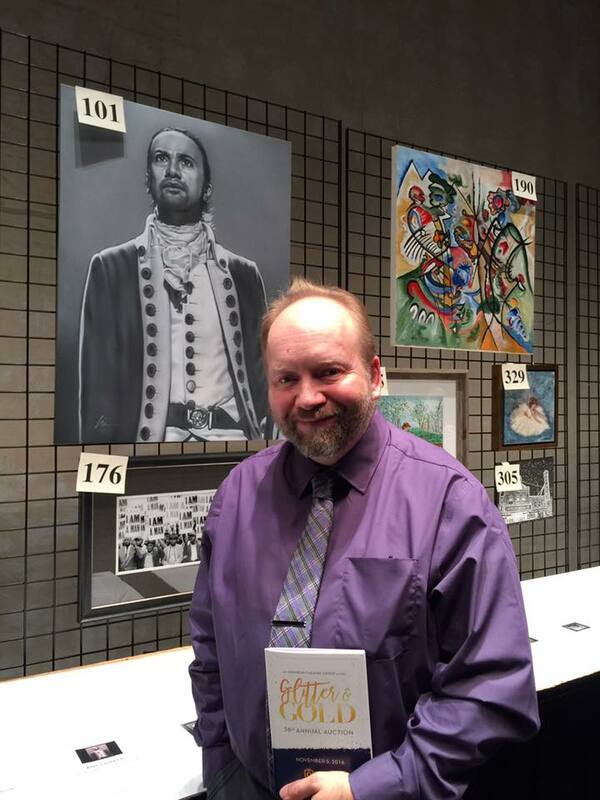 This month I donated another painting to the Orpheum Theatre’s 38th Annual Live Auction. 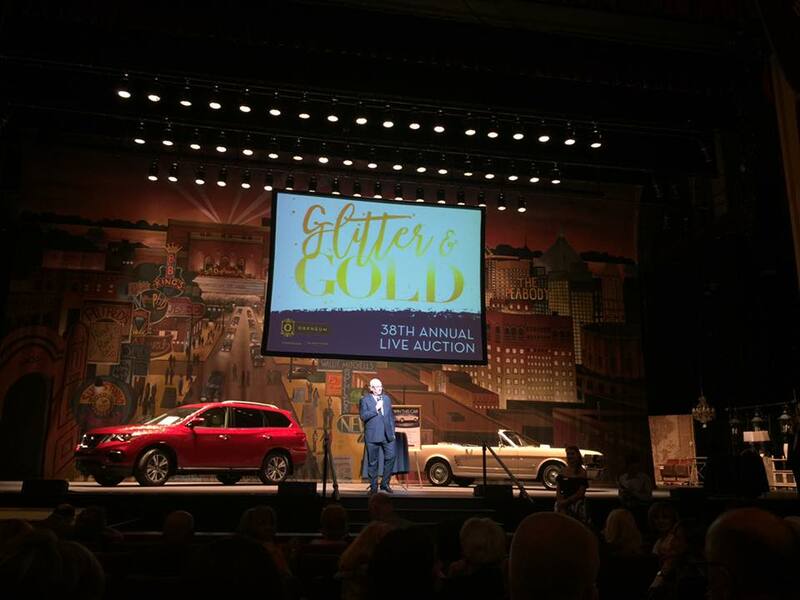 The annual auction benefits the Halloran Centre For Performing Arts & Education, which is next door to the Orpheum Theatre on Main Street in downtown Memphis, TN. All proceeds from the auction benefit the 50,000 students, teachers, and families who participate in their community and education programs. 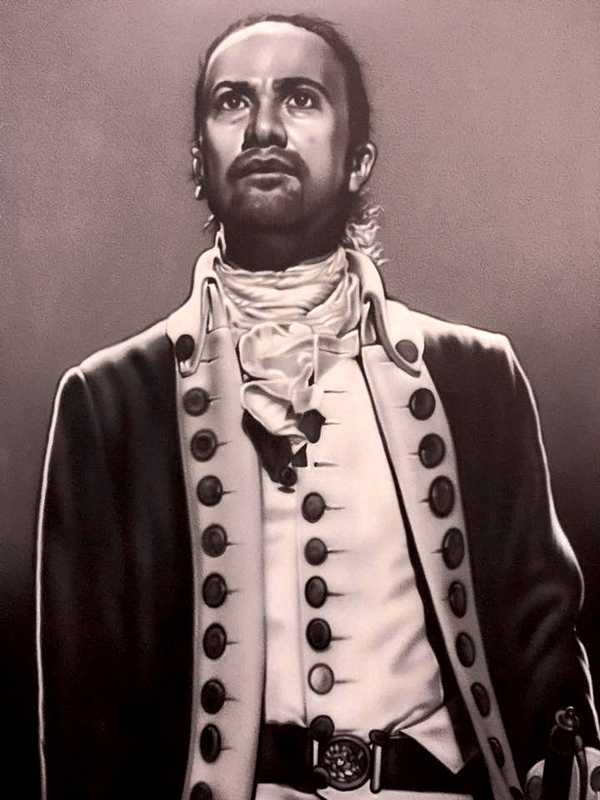 My art donation for this year’s auction was a black and white airbrushed portrait of Lin-Manuel Miranda as Alexander Hamilton from the Broadway musical “Hamilton” (which he wrote and starred in). 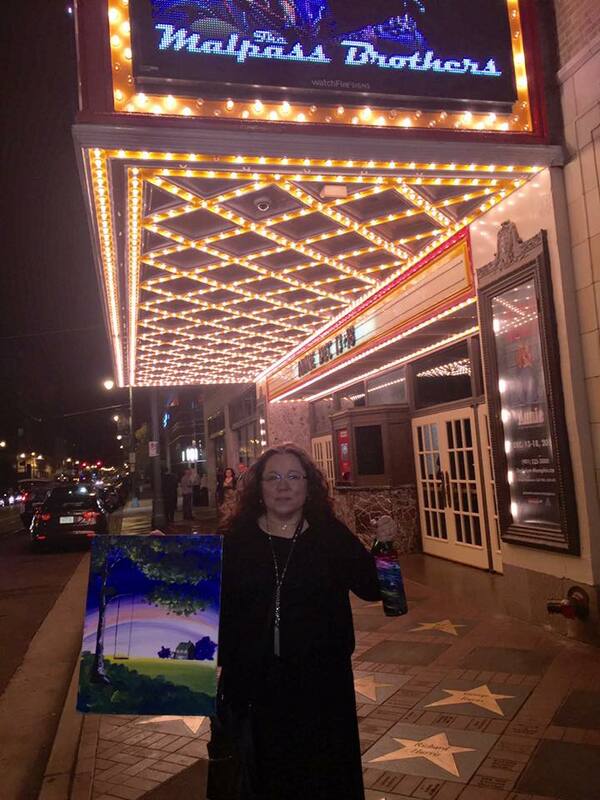 Normally I paint a themed canvas chair provided by the Orpheum, and donate a painting or two that I may have left over from one of my previous art shows. 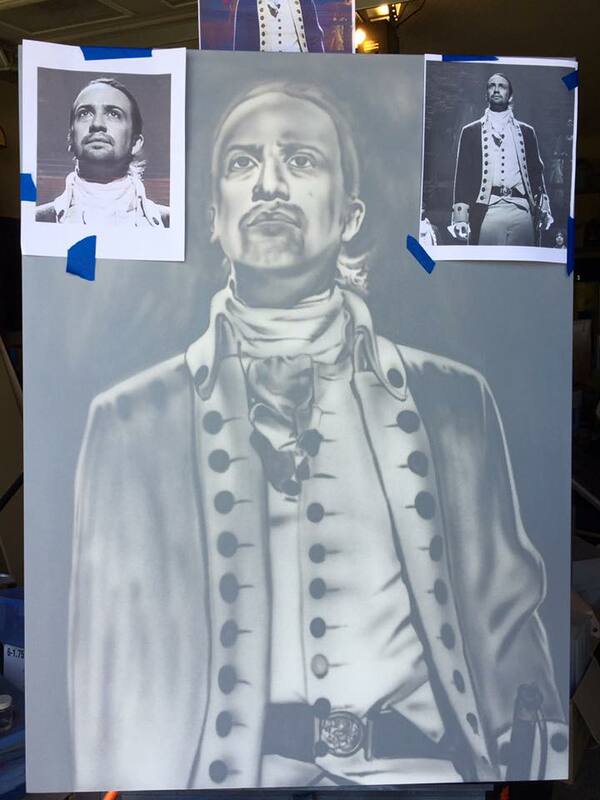 This year the staff decided not to do any chairs, so since “Hamilton” is the hottest thing on Broadway right now (and my wife Nicki is a huge fan) I decided to paint the musical’s creator and star. I worked on it part of one weekend and a couple hours each day after work for almost a week. I’m getting slow in my old age and it took me a bit longer than I had anticipated. 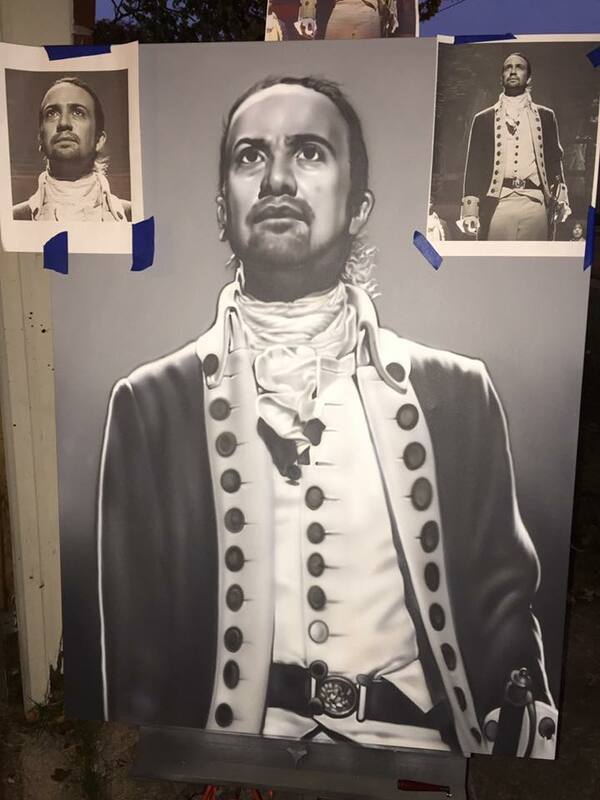 Also, since our garage isn’t fully ready again for me to paint in it, I had to paint in the driveway or at the front of the garage while there was still daylight. 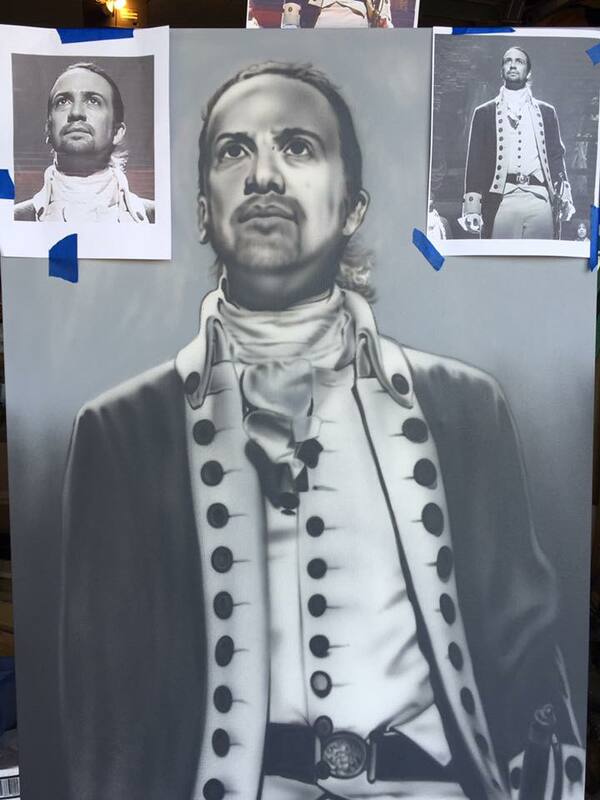 The painting was done on a 30″x40″ canvas with my Paasche VL-3 airbrush and Createx acrylic paints. I used black, white, a light grey, and a dark grey. 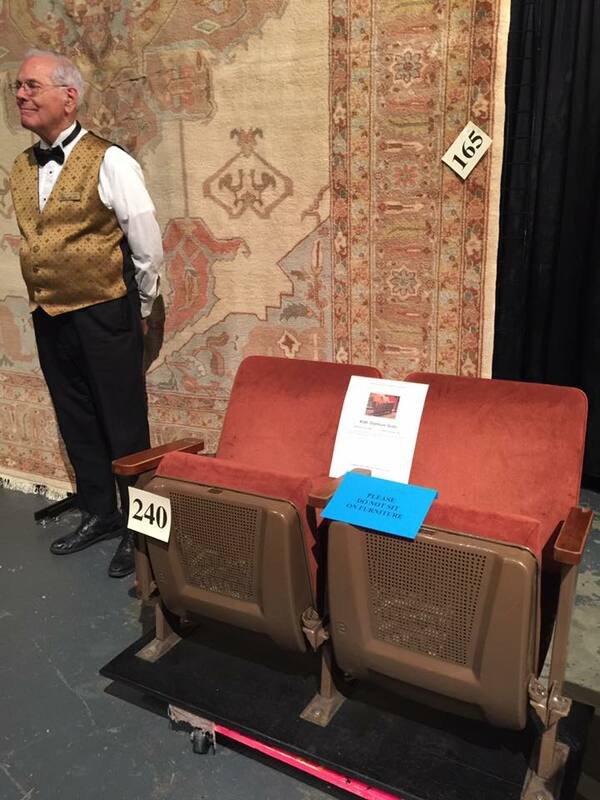 Most of my chairs have been on stage in the live auction, but my paintings are always in the silent auction backstage along with many other paintings, prints, and photos. I love checking out what the other local artists have donated, and we’ve been lucky to win a few in previous auctions. 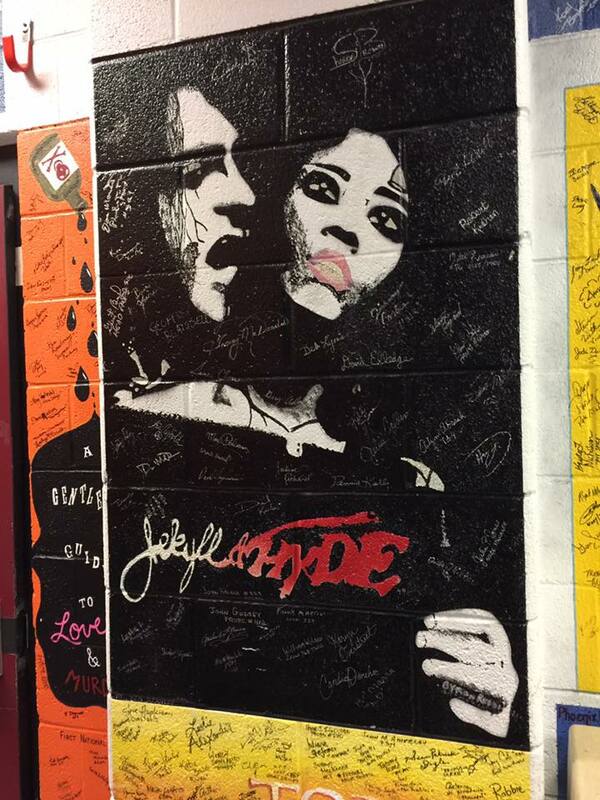 Always great to talk to the other artists, too. We all tend to keep to ourselves a lot. 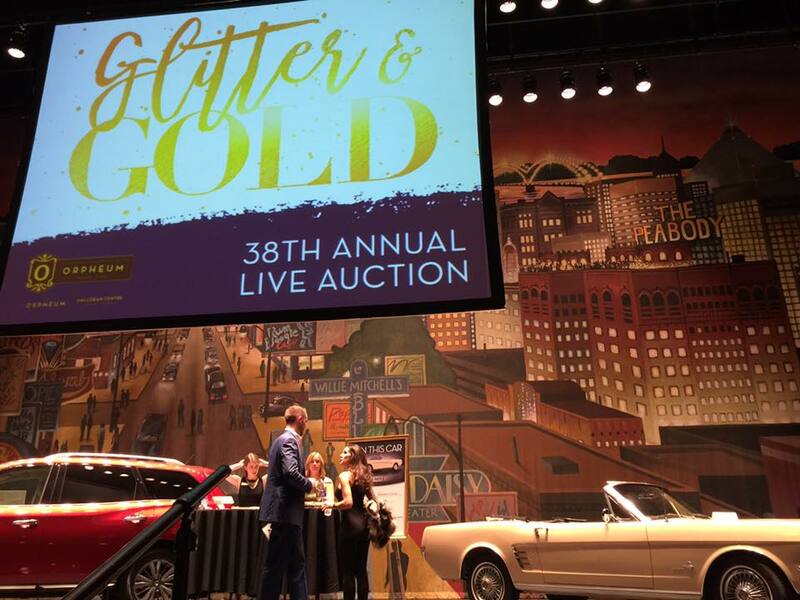 The auction is one of our favorite grown up date nights and a great excuse for us to dress nice and be social. 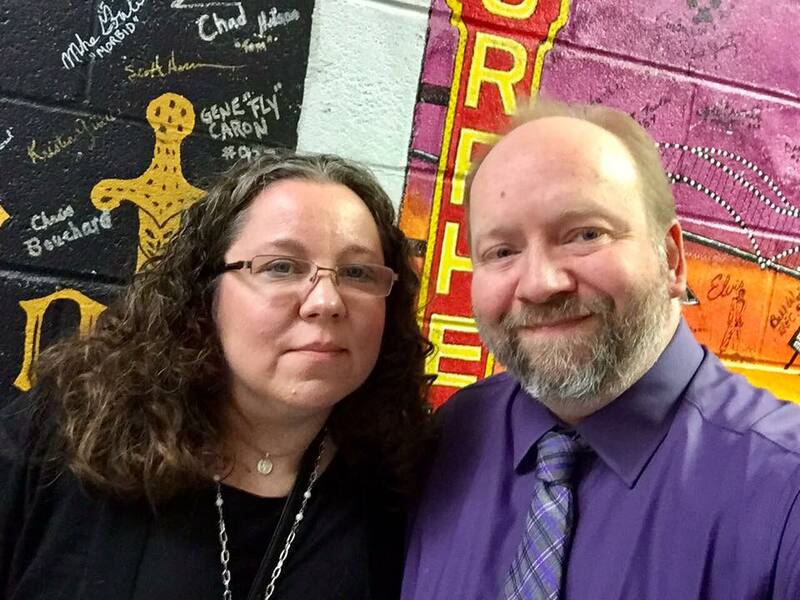 Nicki and I love going backstage at the Orpheum each year- it’s one of our favorite parts of the auction. 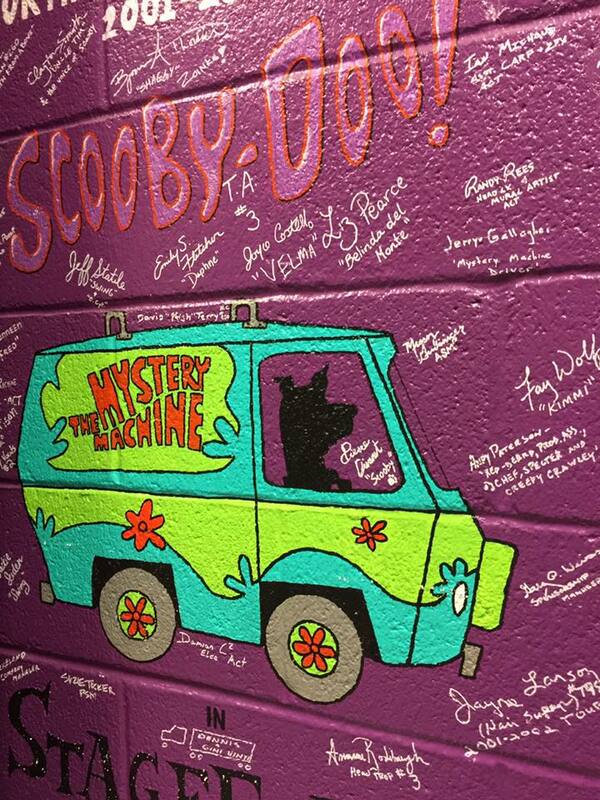 There are lots of great murals for each of the shows that have come to the Orpheum, and each signed by the cast. 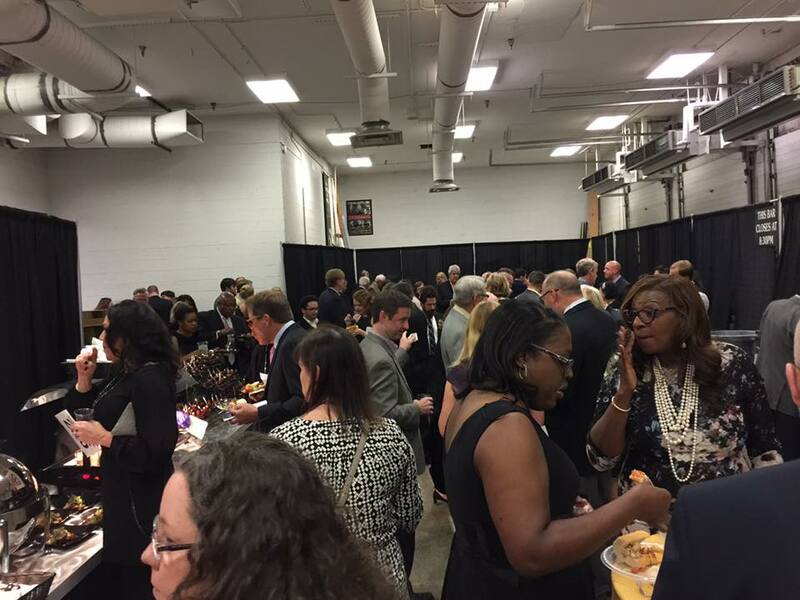 At the rear of the backstage area of the theater they had lots of other silent auction items, plus food stations and bars. 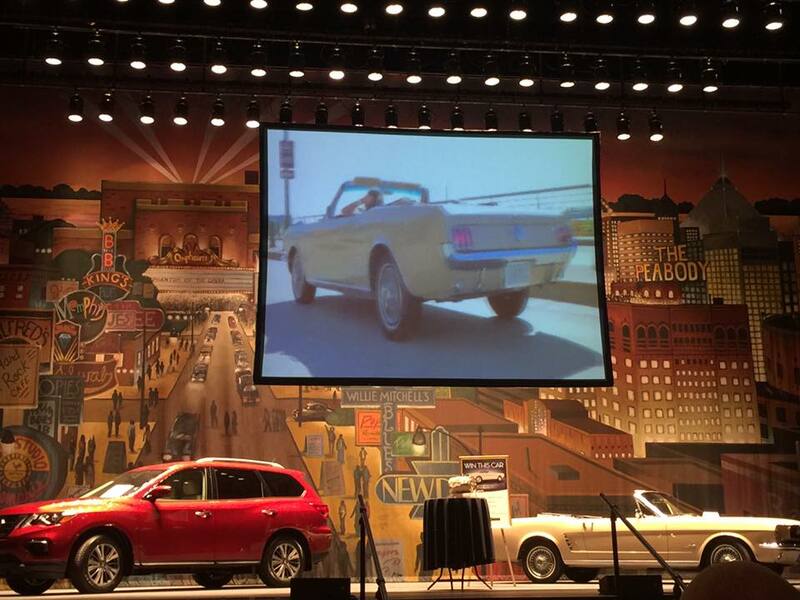 There were also a few food stations on the left of the main stage, and a few more bars in the auditorium and lobby. 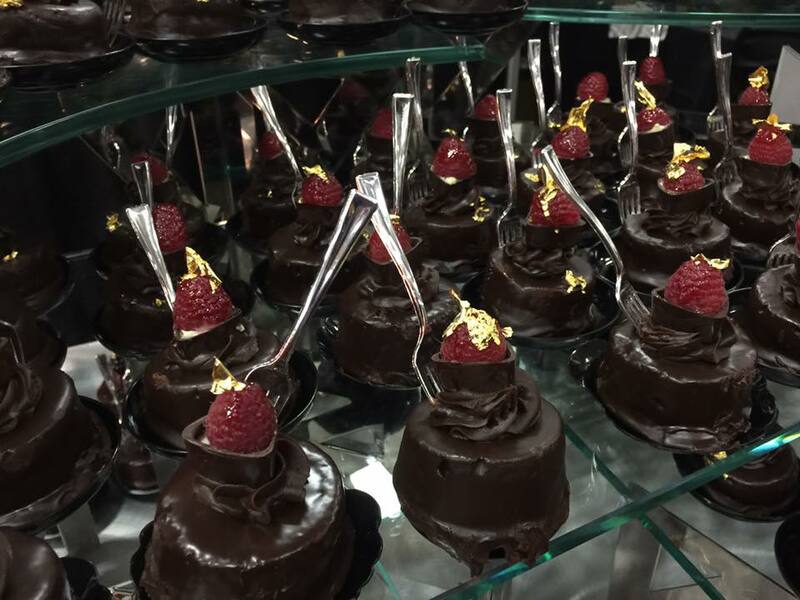 The open bar is nice, and the desserts are always amazing! These were delicious mouthfuls of concentrated chocolate evil. I did eat some fruit, cheese, and Butternut Squash raviolis- but I have to admit I went back for seconds on these. After we were done exploring backstage, we grabbed a bit more food and a couple drinks, and then headed back out to the main part of the theater to get a good seat for the live auction coming up. I do have to admit I did miss seeing one of my painted chairs onstage and experiencing the bidding wars and excitement that they generate. 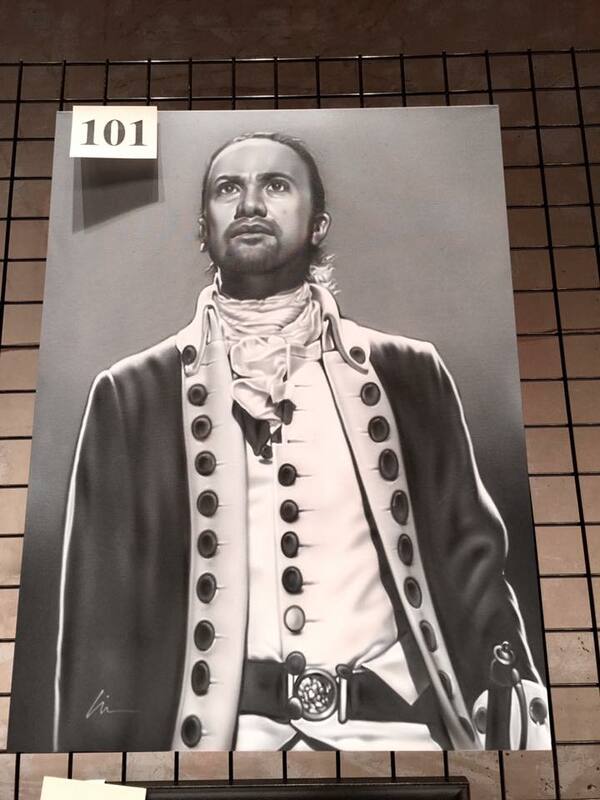 Hopefully they will decide to bring some back or create a new painted signature item for future auctions. 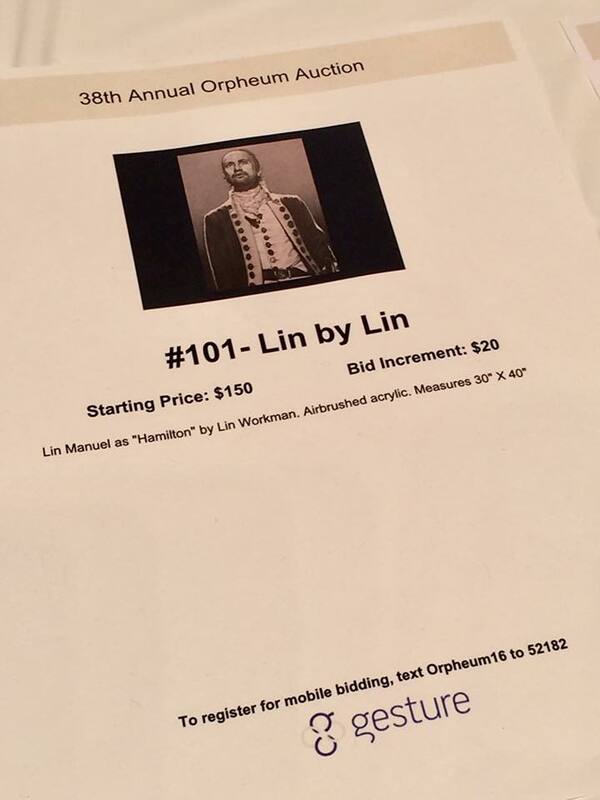 No hovering around the item you wanted waiting to see if you were going to be outbid or to try and outbid someone else at the last minute. 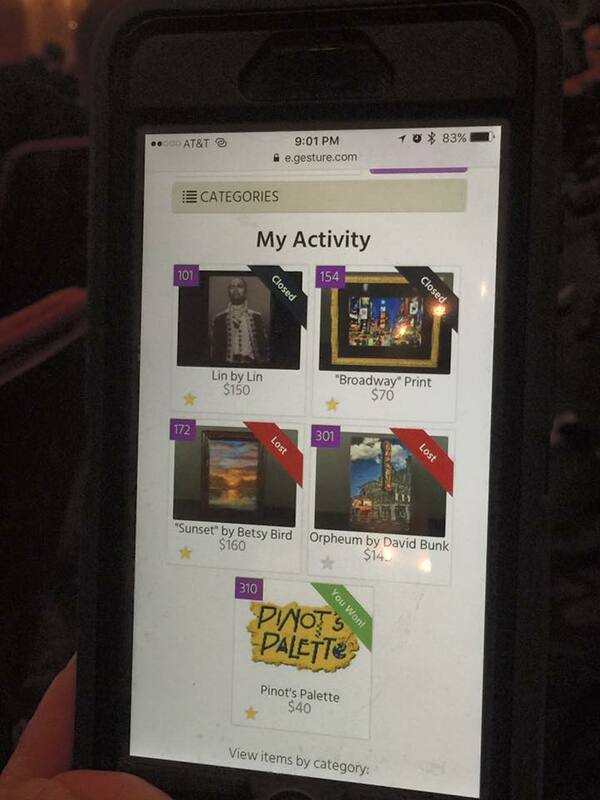 Folks could bid on multiple items and walk around or sit down while keeping an eye on their bids with their phones. 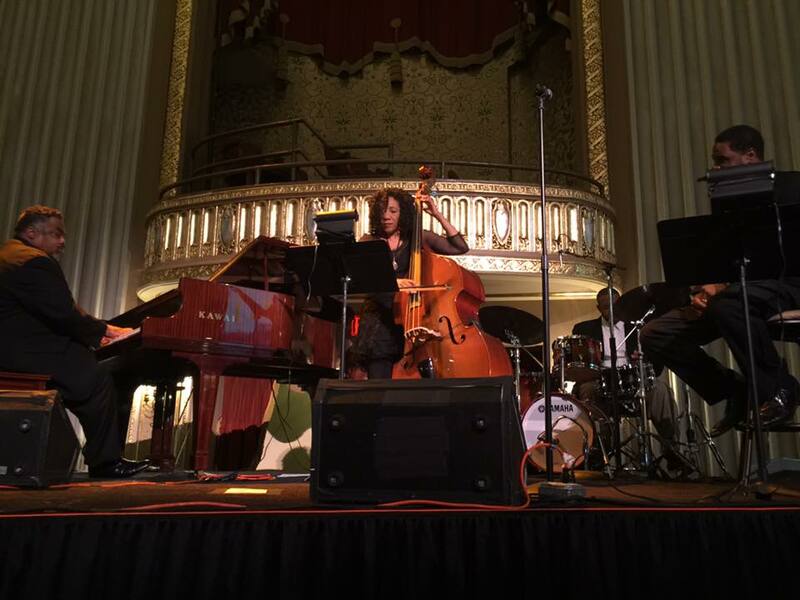 It also gave attendees the chance to enjoy some live music, which was also a new addition to the event that we really enjoyed. 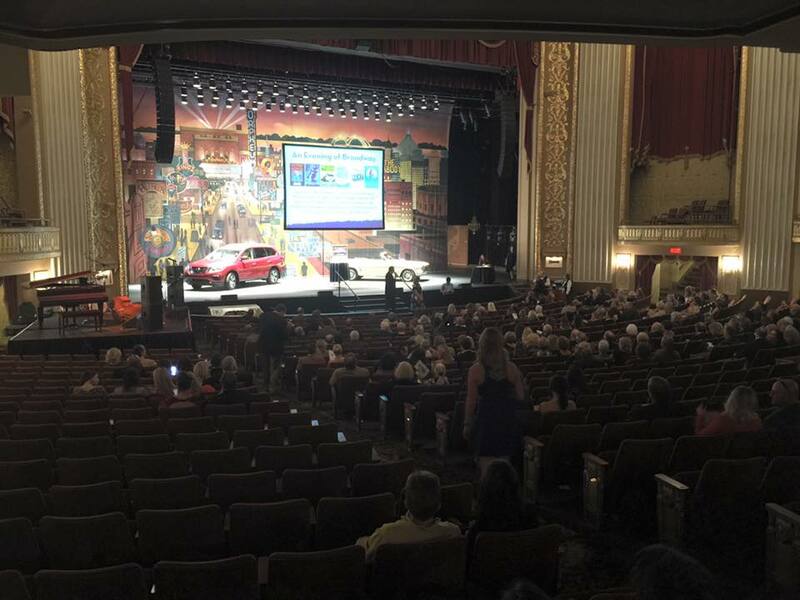 Brett Batterson, the new President and CEO of the Orpheum, welcomed the crowd and introduced the emcee for the evening. 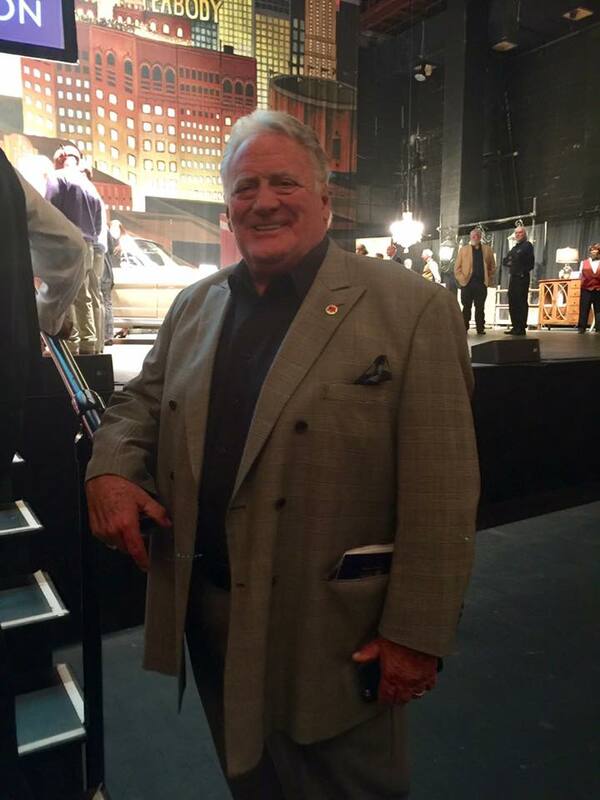 He took over the role of President/CEO of Orpheum Theatre Group in January of this year when Pat retired. 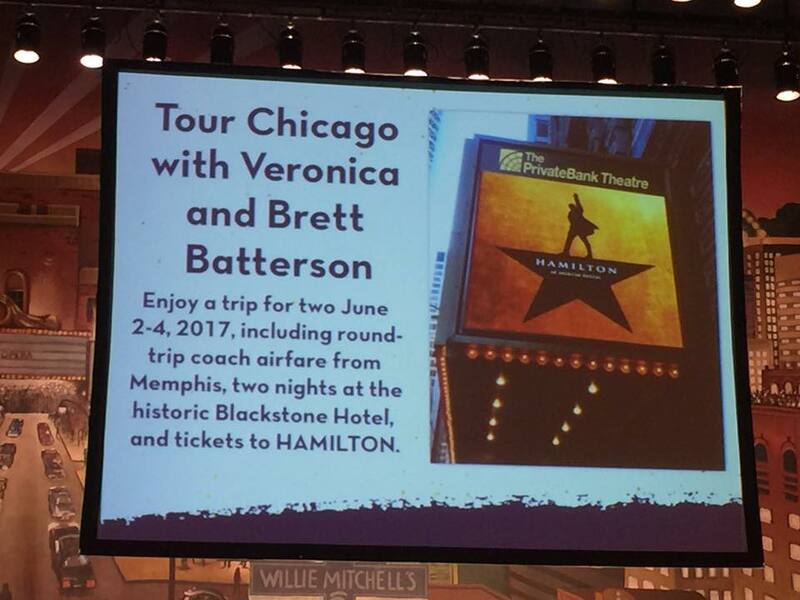 There were lots of great items up for bid in the live auction, and the “Hamilton” trip for two to Chicago was one of the most popular of the night (hosted by Brett and his wife Veronica). It quickly rose above our price range and went for $7,400.00. 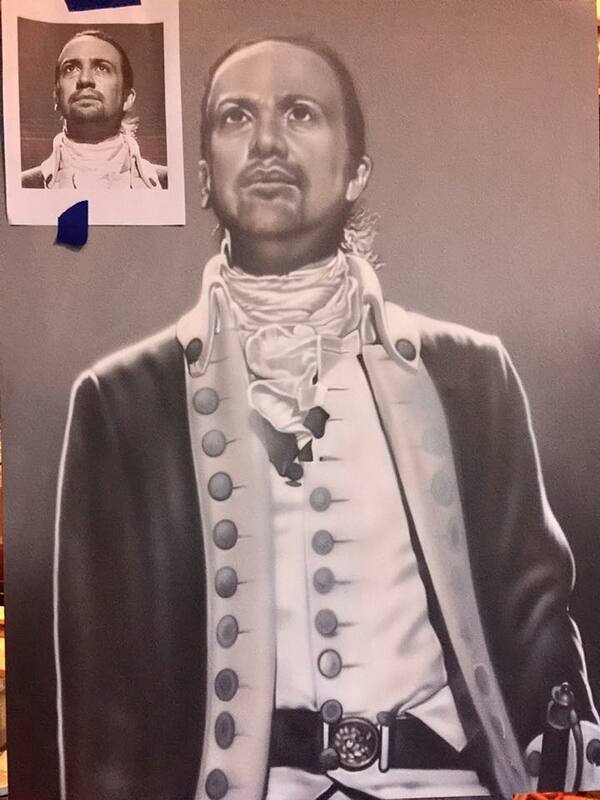 I was glad I chose to do the “Hamilton” painting when I saw this was up for bid as well. 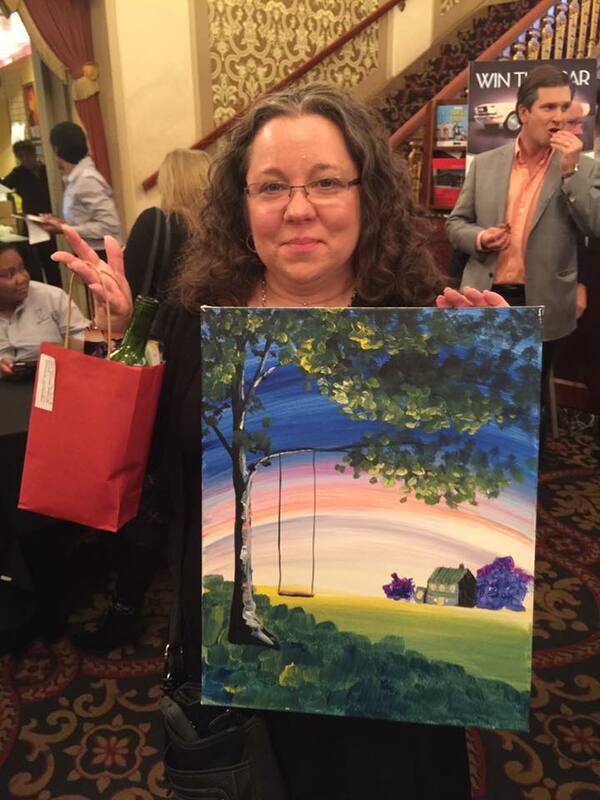 Nicki got outbid on one painting in the silent auction, but was able to win another auction which included a painting, a painted wine bottle, and two Pinot’s Pallet gift cards. 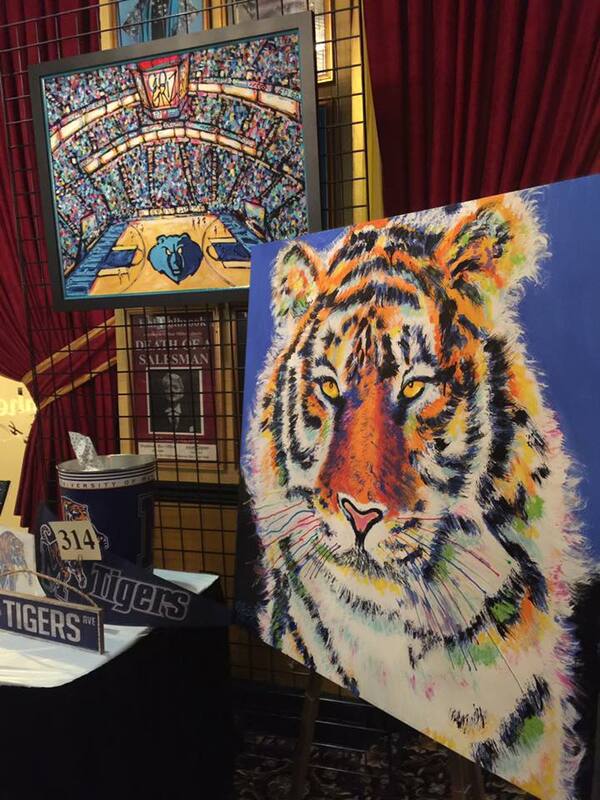 Unfortunately my painting only went for the minimum bid of $150.00. 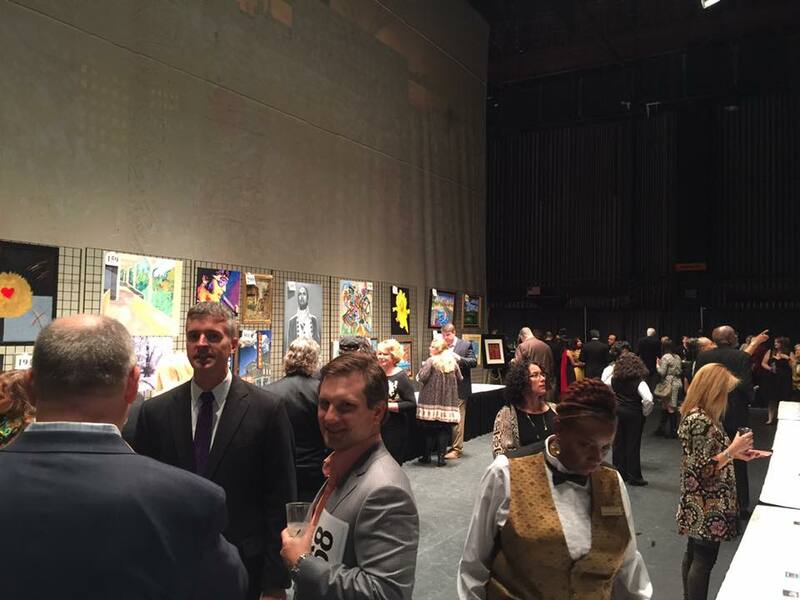 A few weeks prior to the auction Nicki and I, along with several other Memphis artists were invited to talk with Brett, Pat, Vice President of Development Leanne McQuown, and the Orpheum staff about future art related events and auctions at the Orpheum. 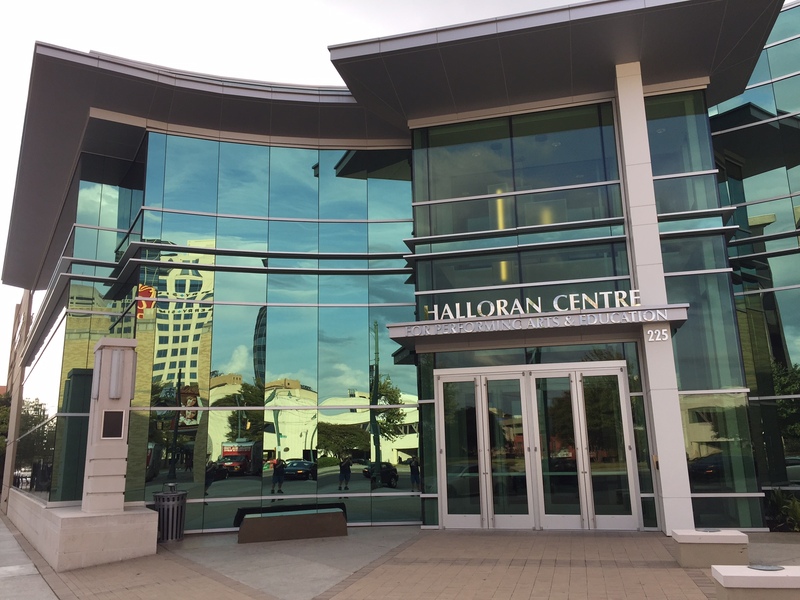 Nicki and I got to take a tour of the new Halloran Centre, and were blown away by it. We both swear they used “Doctor Who” Time Lord technology when they built it! It is much BIGGER on the inside– large lobby with high ceilings, a lounge space facing Main with a fireplace and bar, practice stage (which is the same size of the Orpheum’s stage), recording studio, class spaces, office spaces, meeting room, theater, catering kitchen, reading nooks with books on theater, and more. The building not only utilizes the limited footprint given on Main Street between the Orpheum and MLG&W buildings, but also rents out its space for meetings and other events. This earns money to go back into itself to help with the continued operation and maintenance of the centre. 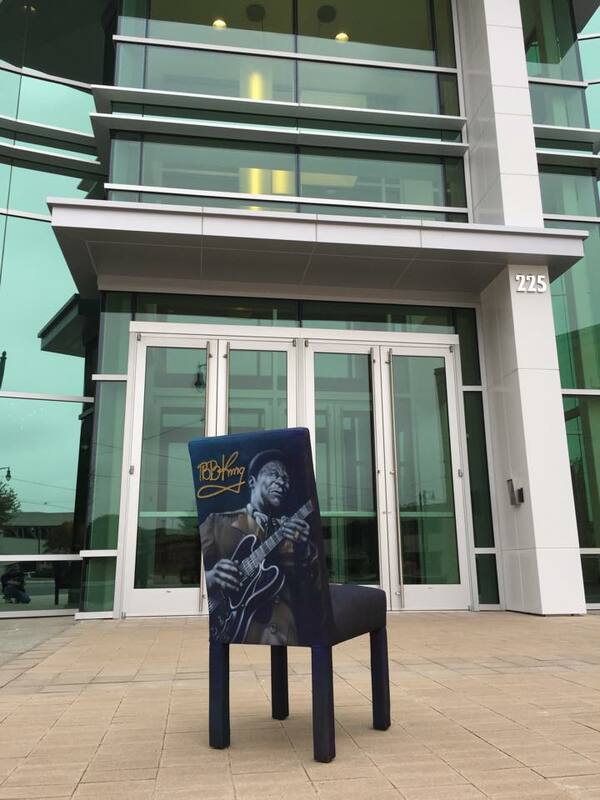 It really is impressive, and was great to see it finally operational and benefiting the city. 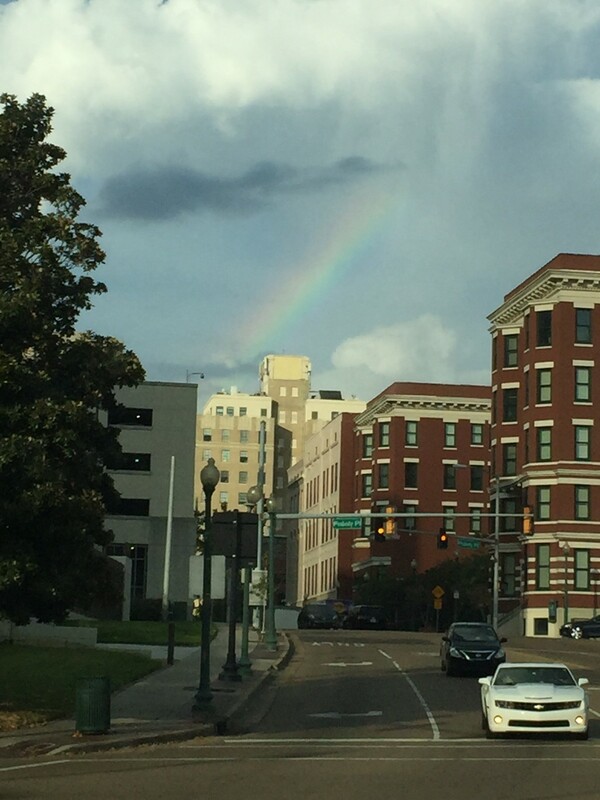 On the day I dropped off my painting to the centre I noticed a rainbow over downtown Memphis as I drove behind the Orpheum. I was about to turn onto Beale Street to head home, but had to wait for the light to chance. May sound a bit sappy, but seeing that rainbow made me smile. Memphis as a whole has a lot of problems, but that sight reminded me that there’s a lot of good in this town, too- and it gave me hope for Memphis. 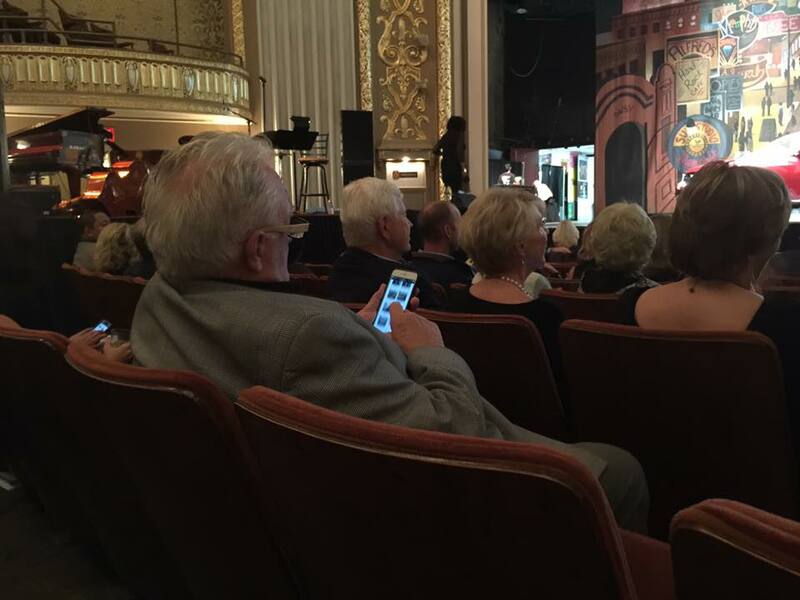 This city is lucky to have the Orpheum Theatre, the Halloran Center, and people who are willing to support them. I’m proud to be a small part of helping such worthy causes, and look forward to future events.